I purchased the Discus glider package today and installed it on FSX running on 64 bit Windows 7. As soon as I attempt to load the Discus glider FSX instantly stops working and closes down. I have tried running WinchX with the glider that comes with FSX and it works perfectly. I then decided to see what happens on a 32 bit machine - I installed the software onto the same PC, this time running 32 bit Vista and FSX. This time the glider loaded but after 30 seconds FSX closed down just as it had under Windows 7. I have repeated both of these tests many time and the results are always the same. I have not any any problems with any other Aerosoft products and am a bit surprised. go into your control panel and under User accounts and family safety-user accounts-turn user account control on or off and uncheck the box and try again. It fixed my problem last night. Thanks Dave - that did the trick although I do hope there is a fix in the future so that User Account Control does not have to be switched off. I am glad that this works. I am no vista user, but I am nearly sure, that you can't do some kind of fix for this. Anyway, I'll ask for you. Now have fin with the plane. Just took delivery of the Discus - awesome. In the sticky notes above wrt water ballast you state: "use the aircraft menu to empty it when desired". Silly question but how do you access the "Aircraft Menu". Sounds: Are there any tips or tricks on how to use the 200 or so additional sounds as referenced in the manual under Aerosoft Sound Control? For example what is the "ID Code"? Is the "STATIC PORT SWITCH", the same as the "Flight Pressure Nozzle", and the same as the "Static Source"? Just to report I have had two CTDs with the BM only when attempting to stow the engine or reduce the throttle (in flight), but I was not quick enough to see the body of the error and will try to reproduce. The other models seem fine. I think the attached image will explain the water ballast question. For the other questions I'll wait for Joachim, we are looking hard at the CTD's, yours seem unrelated to the others. I have removed some posts about the CTD issues because we like to bundle them all here, this will make it a lot easier for us to find out what's happening. 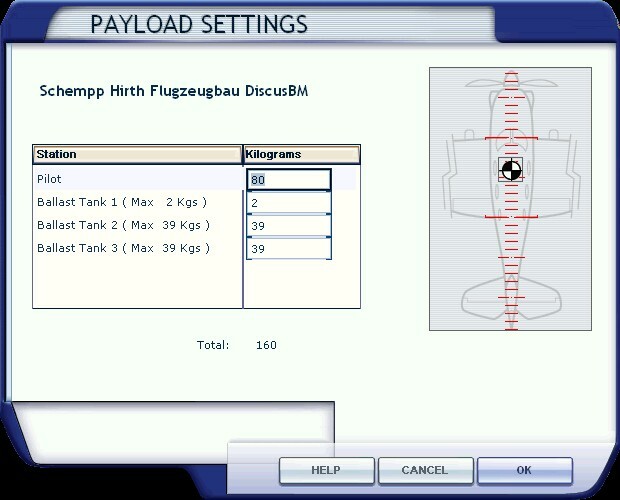 Here is what we know: On 3 systems (of course a fraction of all customers, but that does not matter a lot) using the Discus leads to crashes of FSX. Here is what we expect: There is almost no doubt that this is caused by problems in the way the .NET and Visual C runtimes are installed. Now if you check on Msvcr80.dll issues (that one is for sure reported) you get close to a million hits on Google, it is a very messy issue. MS releases them rather nicely and they are very very well tested and we can say they can't have a lot of bugs in them. The problem is that there are thousands of applications that need them and that many installers include them for that reason. Now many of these installers FORCE these files on the users system and do not so any checking on versions. If this is a WinXP installer used on a Vista system this can even lead to the files being installed in the incorrect position. Now of course professional installers won't have that problem, but we know at least two FS addons that are incorrect there. 3) are you logged on with administrator rights? 4) did you changed anything regarding User Account Control (UAC) on your system? static port switch is the "SEGEL/MOTOR" switch, flight pressure nozzle is a general term for the various pressure inputs, all explained in the post above. Any questions, feel free to stick them on the end of the above post as I'm sure others will have the same. Seems we found another problem with Vista 64 bits. Is anybody with Vista64 NOT experiencing issues? I am real close to buying, but, I run Vista64 so it would be a show stopper . . .
Until further notice I would not advice you to buy this... We need a day or so more to sort this out. Vista is not very liked by developers but Vista 64 bit even less. Now Windows 7 64 bits... That's the best OS I have seen since MsDos 5.1. Although, and this will sound bad, up until recently I had a mission critical Storage Area Network with over 120 terabytes that ran with DOS 5.1 as its core operating system. Fact: in over 10 years it never once experienced an error or outage due to the OS! A friend has the same Problem but Vista 32, he tried that out but the Problem is still there. 3) Yes I am the only account on this computer and I am an admin. 4) I disabled it long ago. Don't give up. I participated in beta and I was running the Discus then with VISTA 64 SP1 Home premium, non-ADMIN, UAC active and FSX installed in default folder, and not one crash related to the Discus (but with the FSX weather engine). I sent Joachim my config for reference. So there will be a solution for sure. Thank you. Glad I found out before purchase, but, really hope this gets sorted out. Looking forward to Win7 as well, hope it is not a painful transition for FSX and all the add ons. This is awesome to fly and it is a quantum leap over the default glider. Any tips on the "SOUNDS" question? i just posted in a German topic but maybe it's a good idea to jump in here as well. It looks like the crashes are fixed after repairing C++ 2008. I had 3 longer flights now without hangup. Btw, the error reports were pointing to a simconnect crash. I tend to believe that WinchX, CumulusX or Sim Probe are the culprit, not the Discus.